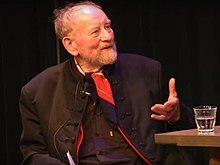 Kurt Westergaard (born Kurt Vestergaard; 13 July 1935) is a Danish cartoonist who created the controversial cartoon of a terrorist, although not the Islamic prophet Muhammad as it is often claimed, wearing a bomb in his turban. This cartoon was the most contentious of the 12 Jyllands-Posten Muhammad cartoons, which met with strong reactions from Muslims worldwide, including Western countries. Since the drawing of the cartoon, Westergaard has received numerous death threats and been a target of assassination attempts. As a result, he is under constant police protection. Westergaard is a trained schoolteacher, educated at Ranum Seminarium. After working as a teacher for some time, he later enrolled at the University of Copenhagen to study psychology. He subsequently worked as a teacher for handicapped children, and has been principal of a school in the Djursland area for the handicapped. Briefly working for the newspaper Demokraten, he has been a cartoonist for Jyllands-Posten since the early 1980s. While working there, he became known for his depiction of Muhammed wearing a bomb in a turban as part of the Prophet cartoons controversy; including cartoon by Westergaard. In a 2009 interview, Westergaard said he was trying to "show that terrorists get their spiritual ammunition from parts of Islam and with this spiritual ammunition, and with dynamite and other explosives, they kill people." He takes issue with the way Danish people have judged his intentions, telling Canadian blogger Jonathan Kay that he has been shunned by many of his former friends: "One of my old friends from the left, he said last year to me 'There are many who say that if something happens to [you], you were asking for it' — that it would be my own fault." Westergaard has criticised the reaction of immigrant communities in Denmark to his cartoon, stating that "many of the immigrants who came to Denmark, they had nothing. We gave them everything – money, apartments, their own schools, free university, health care. In return, we asked one thing – respect for democratic values, including free speech. Do they agree? This is my simple test." Following the release of Dutch politician Geert Wilders' film Fitna, which used Westergaard's cartoon without permission, Westergaard made a cartoon depicting Wilders with a bomb and a sign which reads: "Danger! Freedom of expression". On 12 February 2008, the Danish Security and Intelligence Service (PET) announced the arrest of three Muslims — two Tunisians and one Moroccan-born Dane — who were charged with planning to murder Westergaard. After the plot was foiled, the Danish secret service was made responsible for protecting Westergaard. He was placed under police surveillance when traveling to and from work. His house was fitted with steel doors, a panic room, reinforced glass in the windows and surveillance cameras. On 1 January 2010, a 28-year-old Somali Muslim intruder armed with an axe and knife entered Westergaard's house and was subsequently shot and wounded by police. Westergaard was unharmed due to security precautions in his house. He escaped to a panic room when he saw the intruder standing in the hallway wielding an axe. Westergaard was separated from his five-year-old granddaughter who he left behind sitting in the living room just meters away from the intruder. The intruder attempted to break down the reinforced door with his axe, shouting phrases like "We will get our revenge! ", "Revenge!" and "Blood!" He failed to get through and was shot in the hand and knee by police officers who arrived on the scene within a few minutes. The assailant was arrested, taken into custody and charged with the attempted murders of Westergaard and a police officer. This second attempted murder in two years received extensive coverage in the Danish newspapers. The Sunday edition of Jyllands-Posten included a front-page article about how Westergaard now needs a bodyguard to provide round-the-clock security; a full-page article on the background of the controversy; an interview with Westergaard by Lars Pedersen; a list of quotes showing the "disgust and condemnation" aroused by the attack; an article about the assailant's appearance in a court in Aarhus; two articles about the man himself, who had apparently been living in Denmark for fifteen years and was known to the intelligence services; and, in the editorial and in an opinion piece by political commentator Ralf Pittelkow, advocacy of the values Western society is based on, in particular freedom of expression. According to PET intelligence, the suspect is closely linked to the Somali Islamist insurgency group al-Shabaab, commonly considered a terrorist organization, as well as an al-Qaeda affiliate in East Africa. On 22 June 2011 the assailant was found guilty of an attempt to perform an act of terrorism and attempted murder, by a unanimous jury. The assailant pleaded guilty to unlawful possession of a weapon and breaking and entering, but pleaded not guilty to the other charges. He was sentenced to 10 years in prison followed by permanent deportation from Denmark. In March 2013 a psychiatric patient was taken into custody by the Danish police. According to Danish newspapers the man had been a passenger on a bus, when he started yelling and threatening to bomb the bus and Kurt Westergaard, who was not on the bus. In 2010 Anwar al-Awlaki published an Al-Qaeda hit list in Inspire magazine, including three Jyllands-Posten staff members: Kurt Westergaard, Carsten Juste, and Flemming Rose along with other figures claimed to have "insulted Islam," including Salman Rushdie, Ayaan Hirsi Ali and cartoonist Lars Vilks. The list was later expanded to include Stéphane "Charb" Charbonnier, who was murdered in a terror attack on Charlie Hebdo in Paris, along with 11 other people. After the attack, Al-Qaeda called for more killings. Westergaard has been awarded the Sappho Award, an award given by the Free Press Society in Denmark to a 'journalist who combines excellence in his work with courage and a refusal to compromise'. On 8 September 2010, he was awarded the M100 Media Award (M100-Medienpreis) by German Chancellor Angela Merkel for his contributions to freedom of opinion. In 2011, Westergaard, helped by John Lykkegaard, published his memoir book Manden bag stregen. ^ "Protesters Burn European Embassies, Consulates, Churches in Damascus and Beirut 4–5 February 2006". Switch5.castup.net. Archived from the original on 5 February 2012. Retrieved 4 February 2012. ^ "Cartoon Body Count". Web. 2 March 2006. Archived from the original on 26 March 2006. ^ a b c Drachmann, Hans (3 January 2010). "Tegneren har vendt frygt til vrede" [The cartoonist has turned fear into anger]. Politiken (in Danish). p. 2. ^ a b c d Pedersen, Lars Nørgaard (3 January 2010). "Det kom virkelig tæt på" ['It came really close']. Jyllands-Posten Sunday (in Danish). p. 11. Retrieved 3 January 2010. ^ a b Hansen, John; Hundevadt, Kim (2006). Provoen og Profeten: Muhammedkrisen bag kulisserne (in Danish) (1st ed.). p. 16. ISBN 87-7692-092-5. ^ Nielsen, Line Holm (3 January 2010). "Med Fanden under fødderne" [With the Devil under the feet]. Berlingske Tidende (in Danish). p. 8. Archived from the original on 6 January 2010. Retrieved 5 January 2010. ^ Peters, J. (31 March 2008). "Westergaard tekent Wilders". SpitsNieuws (in Dutch). Archived from the original on 23 June 2011. Retrieved 1 April 2008. ^ "Danish cartoons 'plotters' held". BBC News. 12 February 2008. Retrieved 12 February 2008. ^ a b c Sjølie, Marie Louise (5 January 2010). "'The Danish cartoonist who survived an axe attack'". The Guardian. London. pp. G2 section, pp. 12–13. Archived from the original on 9 September 2013. Retrieved 5 January 2010. ^ a b Beim, Jakob Hvide (28 December 2009). "Westergaard-angriber skal 25 dage i fængsel -"Westergaard-attack, 25 days in jail (translation)". Dagbladet Politiken (in Danish). Retrieved 2 January 2010. ^ a b c d Collás, Xavier (3 January 2010). "Encontré a un tipo con un hacha en el pasillo; mi nieta estaba cerca". El Mundo (in Spanish). pp. 1, 25. Archived from the original on 6 January 2010. Retrieved 5 January 2010. ^ "Kurt Westergaard reddet af sit sikringsrum". Berlingske.dk. Retrieved 4 February 2012. ^ a b Freeman, Colin (3 January 2010). "Axeman who tried to murder Mohammed cartoonist 'had links to terrorist group'". The Sunday Telegraph. London. p. 5. Archived from the original on 5 January 2010. Retrieved 5 January 2010. ^ a b "Drabsforsøg på tegneren Kurt Westergaard" (in Danish). Danish Security and Intelligence Service. 2 January 2010. Archived from the original on 5 January 2010. Retrieved 1 January 2010. ^ Beim, Jakob Hvide (28 December 2009). "Westergaard-angriber skal 25 dage i fængsel – "Westergaard-attack, 25 days in jail (translation)". Dagbladet Politiken (in Danish). Retrieved 2 January 2010. ^ Batty, David (2 January 2010). "Somali charged with murder attempt on Muhammad cartoonist". Guardian.co.uk. London. Archived from the original on 9 September 2013. Retrieved 2 January 2010. ^ Westergaard, Morten; Pedersen, Lars Nørgaard (3 January 2010). "JP-tegner får sin egen livvagt". Jyllands-Posten Sunday (in Danish). p. 1. Retrieved 3 January 2010. ^ Hansen, John (3 January 2010). "Frygten for den rasende ekstremist". Jyllands-Posten Sunday (in Danish). p. 10. Retrieved 3 January 2010. ^ Unattributed (3 January 2010). "Bred fordømmelse af angrebet". Jyllands-Posten Sunday (in Danish). p. 7. ^ Nørby, Erik (3 January 2010). "Terrorist til Vestre Fængsel". Jyllands-Posten Sunday (in Danish). p. JP Århus section, pp. 1, 2. Retrieved 3 January 2010. ^ Westergaard, Morten; Pedersen, Lars Nørgaard (3 January 2010). "Somaliske unge er mere radikaliserede end andre indvandrere i Danmark". Jyllands-Posten Sunday (in Danish). pp. 6–7. Retrieved 3 January 2010. ^ Pedersen, Lars Nørgaard; Nørby, Erik; Westergaard, Morten (3 January 2010). "PET overvågede somalier". Jyllands-Posten Sunday (in Danish). p. 4. Retrieved 3 January 2010. ^ Unattributed (3 January 2010). "Leder: Kulturkamp". Jyllands-Posten Sunday (in Danish). p. 18. Archived from the original on 6 January 2013. Retrieved 3 January 2010. ^ Pittelkow, Ralf (3 January 2010). "Terror mod ytringsfriheden". Jyllands-Posten Sunday (in Danish). p. 18. Archived from the original on 6 January 2013. Retrieved 3 January 2010. ^ Unattributed (2 January 2010). "Danish police shoot intruder at cartoonist's home". BBC News. Retrieved 2 January 2010. ^ McVeigh, Tracy (3 January 2010). "Assassin shot in cartoonist's home has al-Qaida terror links". The Observer. London. p. 27. Archived from the original on 9 September 2013. Retrieved 5 January 2010. ^ "Denmark cartoon trial: Kurt Westergaard attacker jailed". BBC News. 4 February 2011. Archived from the original on 3 February 2013. Retrieved 20 June 2018. ^ Hedegaard, Kristian (22 January 2011). "Øksemanden fik skærpet sin straf". TV 2 News. Archived from the original on 27 August 2011. Retrieved 14 July 2011. ^ "Fængsles for bombetrusler mod bus og tegner | Nyhederne.tv2.dk". nyhederne.tv2.dk. Archived from the original on 1 March 2014. Retrieved 12 July 2014. ^ Dashiell Bennet (1 March 2013). "Look Who's on Al Qaeda's Most-Wanted List". The Wire. Archived from the original on 8 January 2015. Retrieved 8 January 2015. ^ Conal Urquhart. "Paris Police Say 12 Dead After Shooting at Charlie Hebdo". Time. Archived from the original on 7 January 2015. Retrieved 8 January 2015. ^ Victoria Ward. "Murdered Charlie Hebdo cartoonist was on al Qaeda wanted list". The Telegraph. Archived from the original on 7 January 2015. Retrieved 2 April 2018. ^ Lucy Cormack (8 January 2015). "Charlie Hebdo editor Stephane Charbonnier crossed off chilling al-Qaeda hitlist". The Age. Archived from the original on 11 January 2015. Retrieved 8 January 2015. ^ "Jyllands Posten, Danish Newspaper". Jp.dk. Archived from the original on 18 April 2009. Retrieved 4 February 2012. ^ "Jyllands Posten, Danish Newspaper". Jp.dk. Archived from the original on 19 April 2009. Retrieved 4 February 2012. ^ "Medienpreis M100: Merkel ehrt Mohammed-Karikaturisten - Panorama". Stern. De. 8 September 2010. Retrieved 4 February 2012. ^ "Westergaard-bog er ynkeligt redigeret". politiken.dk. 15 January 2011. Archived from the original on 13 June 2014. Retrieved 30 May 2014.